This story is a standalone 85 minute TV story introducing the eighth Doctor. 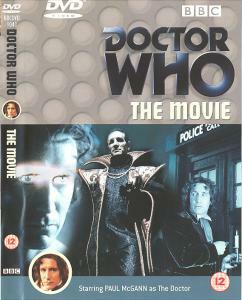 Its onscreen title is "Doctor Who", the DVD cover calls it "Doctor Who The Movie", and the director suggested fans could use the semi-official title "Born Again". Most fans (and this site) refer to it as "The TV Movie". It was intended as a pilot for a new series that never happened. The seventh Doctor is fond of mixed metaphors and malapropisms. He tends to plan and take proactive action against his foes, rather than just react and make it up as he goes along. This is eighth Doctor's first appearance. The new characters of Grace Holloway and Chang Lee are sometimes thought of as companions, even though they never travelled with the Doctor. The Master is a Time Lord and a long time rival and enemy of the Doctor. The story opens with him being apparently killed by the Daleks, another long running foe of the Doctor.